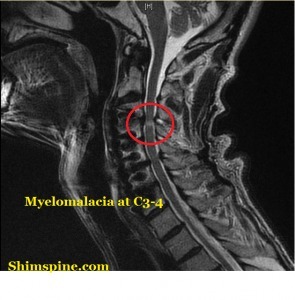 What is Cervical Myelopathy? By definition, it is any functional change of the spinal cord. Usually, it is caused by pinching of the spinal cord by bone spurs, disk herniations, or a combination. In the above MRI, the red circle identifies changes in the spinal cord (see the different coloration) in a man with complaints of progressive arm numbness, weakness and pain. He had prior cervical surgery, but the spinal stenosis continued to manifest as Cervical Myelopathy. Common Cervical Myelopathy complaints include arm pain, and tingling, a heavy feeling to the legs, difficulty with brisk walking, and an electrical sensation from the neck to the extremities. As Cervical Myelopathy progresses, it can lead to a very weak, and awkward gait, bladder and bowel disturbances, and eventually, difficulty with coordination of the arms and legs. While Cervical Myelopathy is usually a slow progressive process, it can be associated with rapid deterioration of function. If you have neck pain, with tingling or weakness to the arms or legs, you should at least discuss the complaints with your physician. If there is any concern for myelopathy, usually diagnostic studies such as cervical MRI’s or CT scans will identify the problem. If the diagnostic studies identify mild spinal compression, the Cervical Myelopathy can be observed, and monitored. On the other hand, if you have rapid progression of your complaints, surgical intervention usually is necessary for Cervical Myelopathy. The surgical techniques include removal of the disk or bone spurs from the front of the neck, with anterior discectomy or corpectomy with fusion. Sometimes, the findings call for a posterior cervical laminectomy, or laminoplasty. Sometimes, the bone spurs require such significant bone resection that you will require posterior fusion along with the decompression. Sometimes, the spinal cord compression is such, that it requires both an anterior and a posterior procedure to adequately decompress the spinal cord. All the surgical interventions must also consider the medical condition of the patient, as a majority of patients who have myelopathy are typically older, and have other medical issues. Cervical Myelopathy has potential to cause a significant permanent spinal cord injury, so if you have any of the above symptoms, please discuss the situation with your physician.